With Destinations, users type the name of a continent, country or state, and add the word ‘destination’ to their search to view a collection of cities and attractions. Google has introduced a new Destinations feature within Google search on mobile, allowing users to plan their next vacation within Google’s search results. With Destinations, users type the name of a continent, country or state, and add ‘destination’ to their search to view a collection of cities and attractions, as well as flight and hotel prices for upcoming dates. Users can also type the name of a location and replace ‘destination’ with an activity, like surfing or skiing (as examples), to view destinations which fit those requirements. While browsing a collection, users can filter their results based on their travel dates, budget and specific interests. Tapping on an individual city or attraction within a collection brings up more information, including details about the area’s weather and expected popularity during specific months of the year. Once users have found the perfect trip, tapping the ‘Plan a trip’ button allows them to search for hotel and flight prices on their specified dates, with data pulled from Google Flights and Hotel search. Users can customize their results by selecting a hotel class, changing the number of travelers and more. 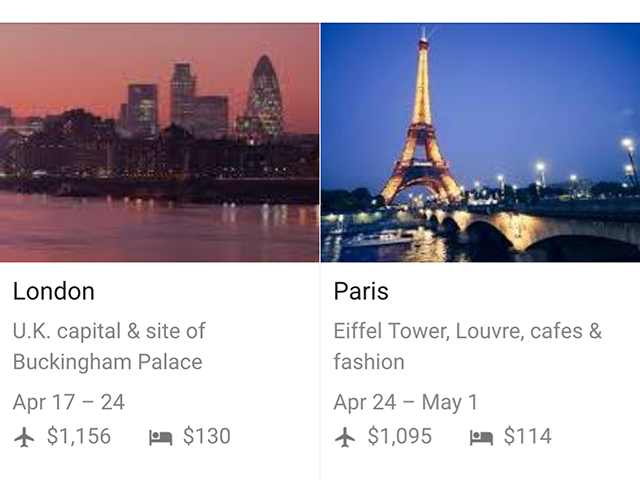 Readers: Will you use Google’s Destinations feature to plan your next trip?